This article completes my selection of Blake’s late tempera paintings, and follows on from the last article on those between 1800-1810. There appears to have been a gap in Blake’s use of glue tempera from 1810 to about 1819, but from then until his death, he produced a steady trickle of new paintings using glue tempera. Here are some of the highlights of that last period, from 1819 to 1826. 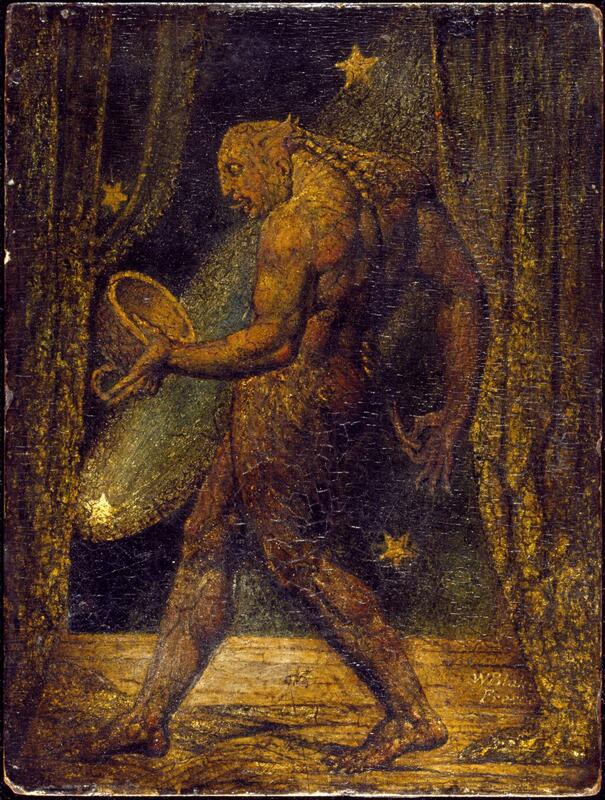 The Ghost of a Flea (c 1819–20) is one of Blake’s more distinctive images. It has traditionally been ascribed to a vision that Blake had of the ghost of a flea, but that explains little. It shows a strange daemonic figure, which is the ‘ghost’ from within the small flea seen directly below its left knee. Its right hand is holding some sort of proboscis or feeding tube, and its left hand holds a large cup in which to contain blood, presumably. Drapes frame the figure, and behind is a night sky with stylised stars, one of which appears to be a meteor. Human fleas and other parasites were unfortunately very common at the time, particularly in densely-populated areas such as London. After about 1820, Blake adjusted his glue tempera technique, using thinner paint films which have survived much better, even though some were painted on paper. This is more of an intermediate between true watercolour and his earlier glue tempera method. The Sea of Time and Space (1821) was only discovered in 1947, when it was found on top of a cupboard in a country house in Devon, England. It is a complex and inventive work which has generated much speculation as to its reading, but little agreement. 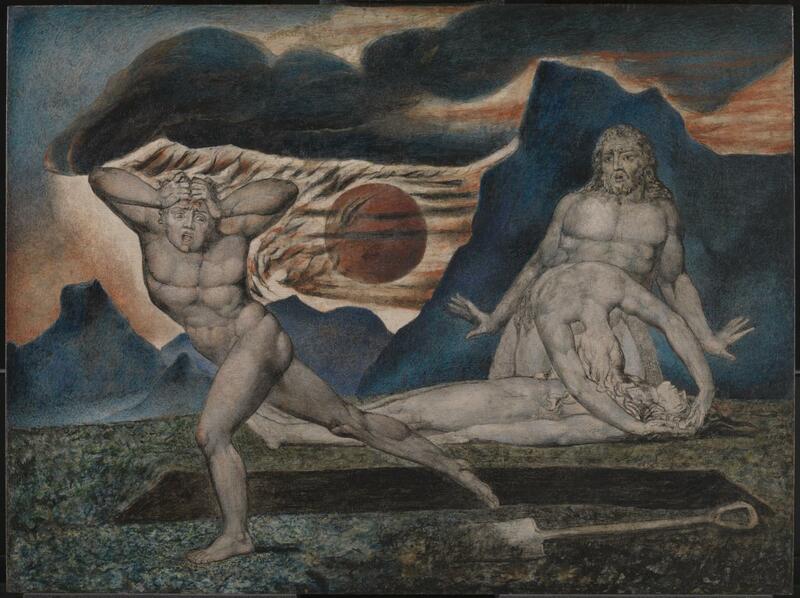 It may be rooted in Blake’s mythology, with Urizen and his sun chariot at the top left. Several key figures are ranged across the foreground: at the left, is a man wearing red, who kneels before a rough sea and is apparently trying to calm it. Next to him is a goddess veiled overall, and pointing up to the heavens. It has been claimed that she is Vala, the goddess of Nature, and her veil is the film of matter which covers all reality. Dancing maidens at the right are at the foot of steps which rise through an avenue of trees, sweeping up and across the painting to the sun chariot. Below that chariot is a flying goddess who is presumably a form of zephyr. Heppner has proposed that the man in red is Isaiah, whose gesture indicates prophetic yearning. The veiled woman is the personification of Ovidian and Pythagorean Nature, who stands in apposition to Isaiah. She points towards the present world, but he points towards a world of imagination beyond. Apollo is the sun god at the top left, with Aurora below. At the right is the cave of the weavers, whose occupants form the material world and renew the human life cycle. Winter (c 1820-25) above and Evening (c 1820-25) below formed a pair for a fireside surround in the Norfolk rectory of Rev John Johnson. They show figures illustrating William Cowper’s poem The Task, book 4. Winter is taken from lines 120-129, and Evening from lines 243-260. Cowper was the patron’s cousin. Sadly, with his thinner paint films, both have suffered severe fading, to the point where little of their original colour remains. However, their fine detail can still be seen. William Blake (1757–1827), Evening (c 1820-25), tempera on pine, 91.8 x 29.7 cm, The National Gallery of Art (Gift of Mr. and Mrs. Gordon Hanes, in Honor of the 50th Anniversary of the National Gallery of Art), Washington, DC. Courtesy of The National Gallery of Art. Courtesy of The National Gallery of Art. William Blake (1757–1827), Virgin and Child (1825), tempera on panel, 28.6 x 23.5 cm, Yale Center for British Art (Paul Mellon Collection), New Haven, CT. Courtesy of The Yale Center for British Art. 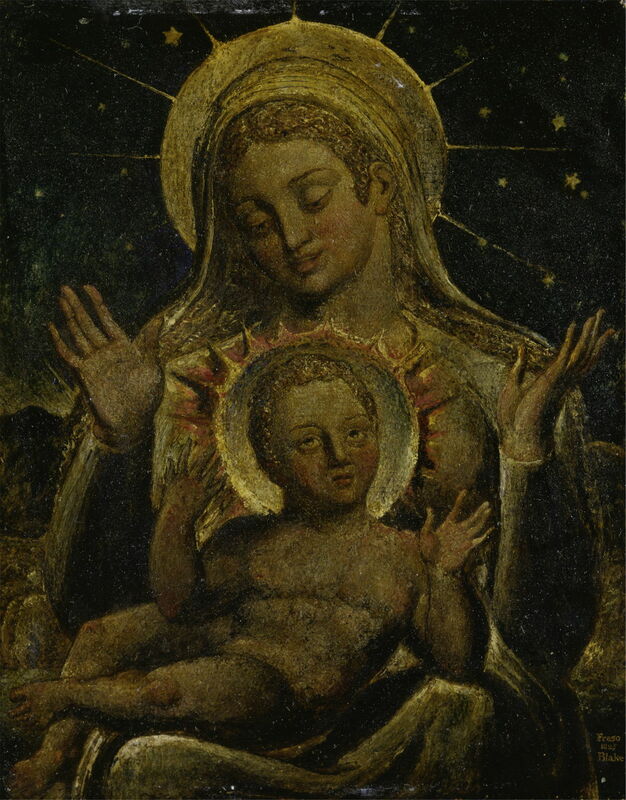 This Virgin and Child (1825), sometimes known as “The Black Madonna”, was painted using Blake’s former manner, with heavier layers of paint, so has darkened considerably. It has possibly been incorrectly dated on the basis of its inscription, which may not be original. The Body of Abel Found by Adam and Eve (c 1826) was painted using Blake’s later technique, with thinner paint films, so has survived much better. 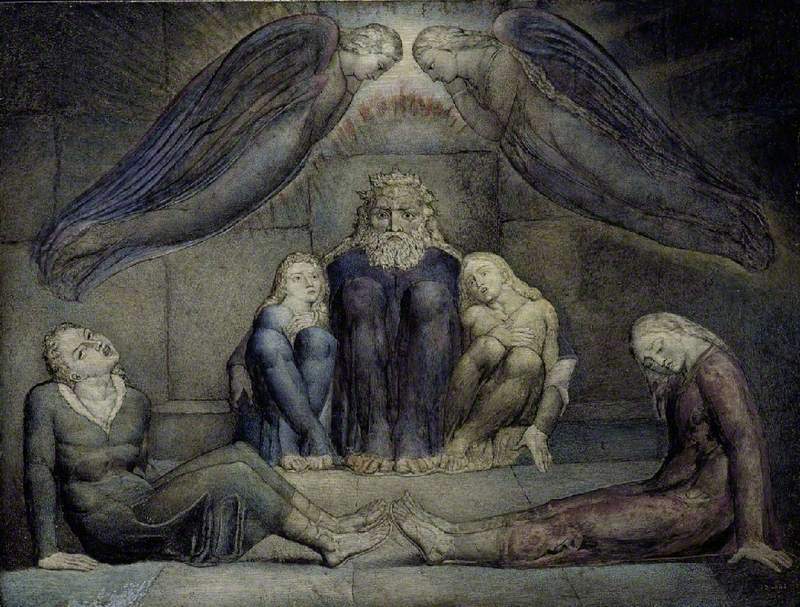 It is a revised version of a watercolour which Blake had included in his 1809 exhibition, and shows Cain with the dead Abel, and his parents, Adam and Eve. The latter couple are shown behind, Eve mourning on Abel’s body, and Adam looking shocked at Cain, as he tries to flee the scene. He had been attempting to bury the body of his brother, after he had murdered him. 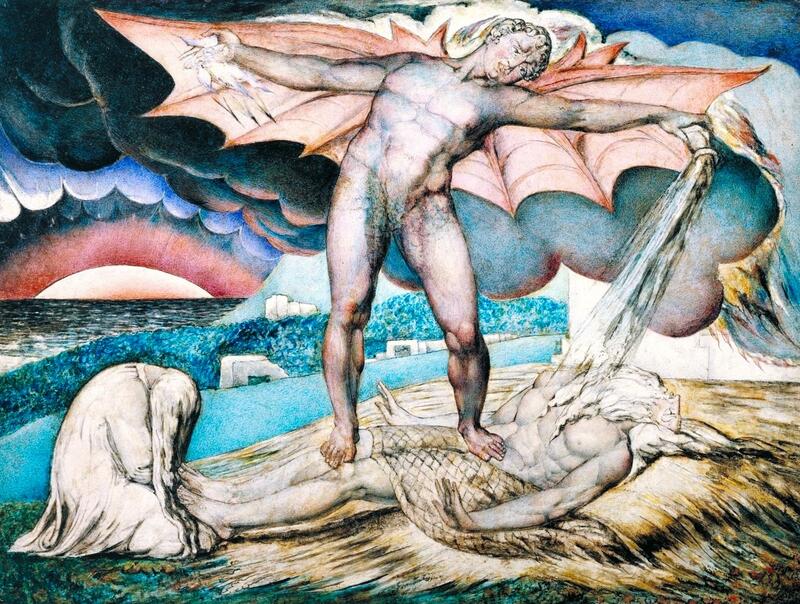 Satan Smiting Job with Sore Boils (c 1826) is one of the most colourful and dramatic of Blake’s surviving glue tempera paintings. It develops an image which Blake had engraved for his illustrations to the Book of Job the previous year. The face of Satan is remarkably similar to those of Blake’s other depictions of him, and fits contemporary physiognomic theories. Job wears the long, flowing hair and beard of someone who lived long ago, although he is not necessarily intended to be old himself. His wife weeps in pity at his feet. Behind – in what was originally green rather than blue – is rolling countryside, the sea, and a setting sun, making up a powerful and moving design. Count Ugolino and His Sons in Prison (c 1826) shows a complex episode from Dante’s Inferno Cantos 32 and 33, of a nobleman accused of treason. Thrown into prison for his alleged crime, Ugolino, his sons and grandsons were all starved to death, a scene also shown in a painting by Fuseli in 1806. Blake’s image adds a pair of angels in a design with strong formal symmetry. As in his watercolours and prints, several of Blake’s later tempera paintings are exceptional works which reflect his genius. The two remaining Spiritual Forms, although sadly darkened, are highly inventive political and social commentary, which tread the fine line between criticising heroes of the time and depicting the horrors of the apocalyptic events which they led. Satan Calling up His Legions is another visionary image of hell, and The Ghost of a Flea shows a very Blakean daemonic figure. But of all these works, it is The Sea of Time and Space which is the most elaborate and challenging to read. 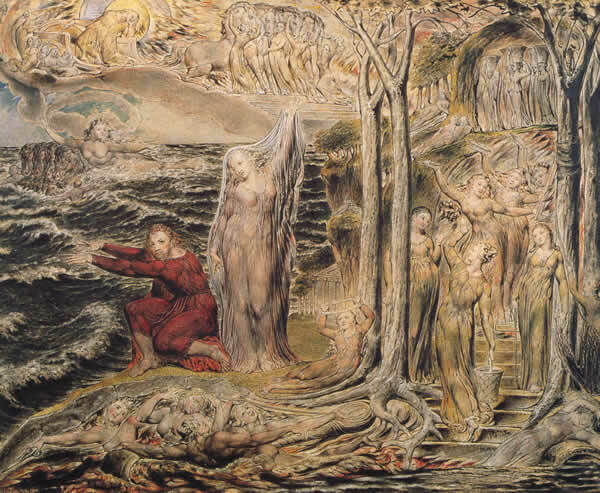 Whether you consider it framed in Blake’s mythology, or his inventive twist of classical mythology, it is a painting which you want to look at again and again, to discover and discuss.